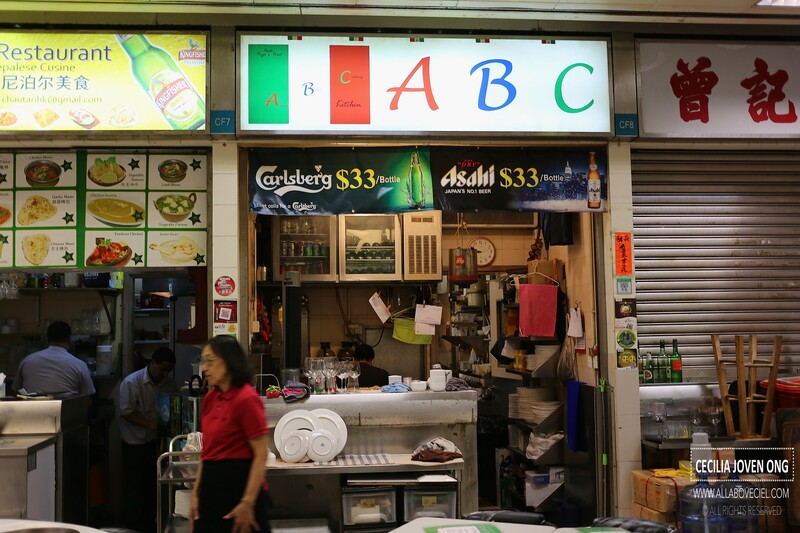 If you wonder, ABC Kitchen is just like our kind of hawker stall located in a one of those food centres in Hong Kong. I was there once and quite enjoyed the lunch i had there. This time, i managed to make a reservation for dinner on my birthday through an email. They replied promptly and acknowledged the reservation. As i have overlooked their operating hours and indicated in the email that i would like to have my dinner at 6.30 pm, which is 30 minutes before their operating hours. They suggested that i could just go in early, order a drink first then order at 6.45 pm, and they will start serving it from 7 pm. It was a Sunday. I got there at about 7 pm, it was not as crowded as i expected. There were quite a few tables lined with checked tablecloths with table setting around. I approached a service staff and mentioned that i have a reservation and quickly led to one of those tables and presented with the menu thereafter. After decided what to order for the starters and the main dishes, i checked with the gentleman that was taking my order whether i should order my desserts first or do it later. He suggested that i should just order it and they will serve it accordingly. 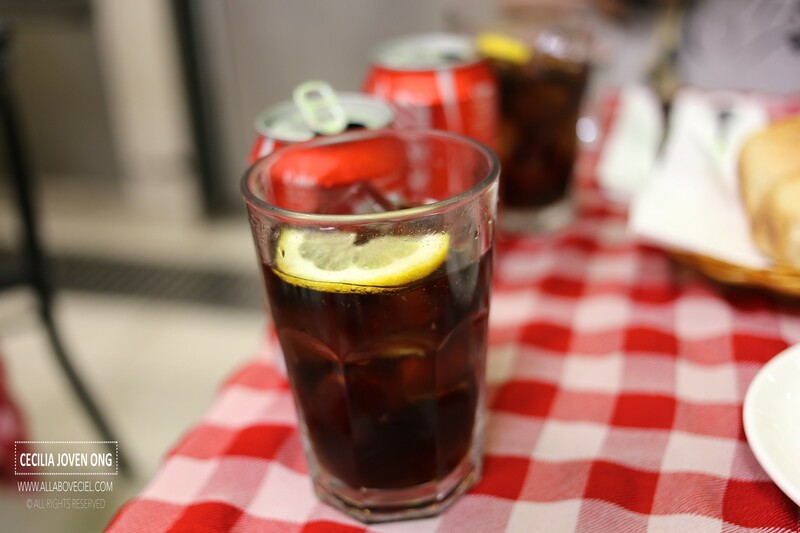 Though they are serving an extensive range of alcoholic drinks, juices and even gourmet coffee but we decided to go with just soft drinks at HKD $15 per can. It was served right after the order was taken. The serving staff did not just leave it there but they actually opened the can and poured it into those glasses. 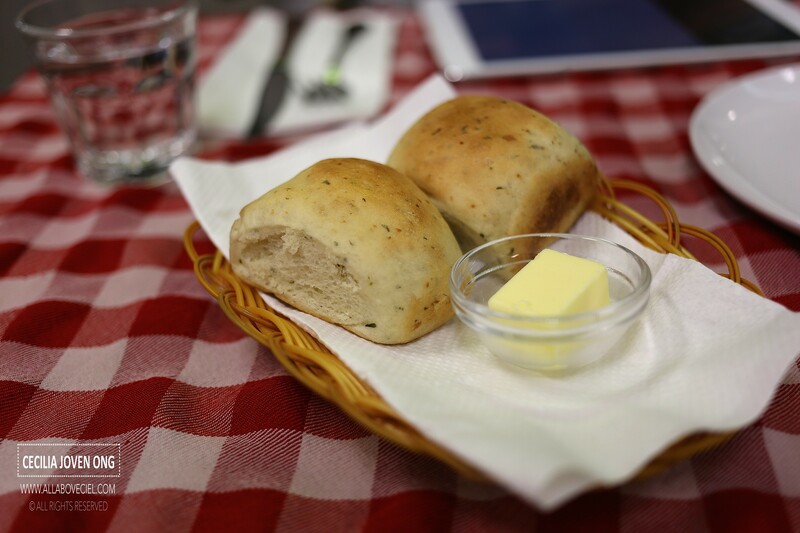 The complimentary buns and butter came right after. The buns were still had a slight warm and with a soft texture. This was a good start as the main dishes took quite a while to arrive. The Soup of the Day was Pumpkin Soup at HKD $33, one of the starters listed in the menu, it was served with few pieces of croutons in it. 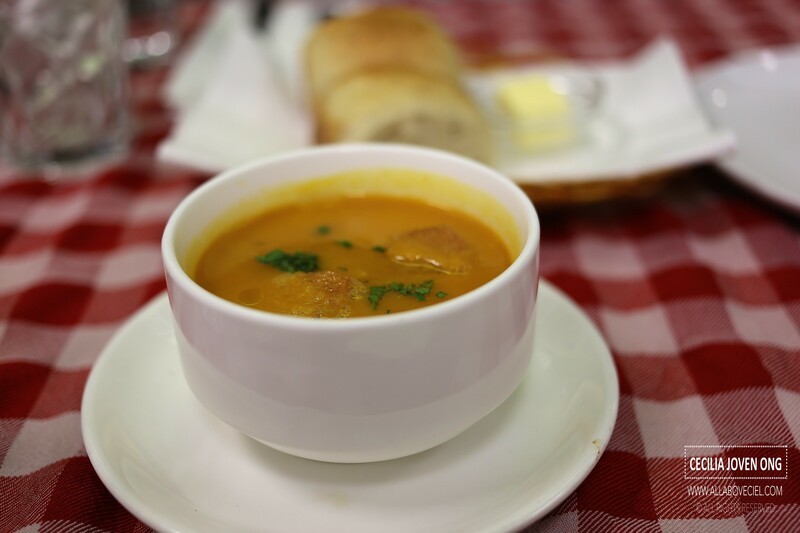 The texture of the soup was rather thick and not too creamy. Next up was another starter, a Pan-fried Foie Gras with Apple Sauce at HKD $128. 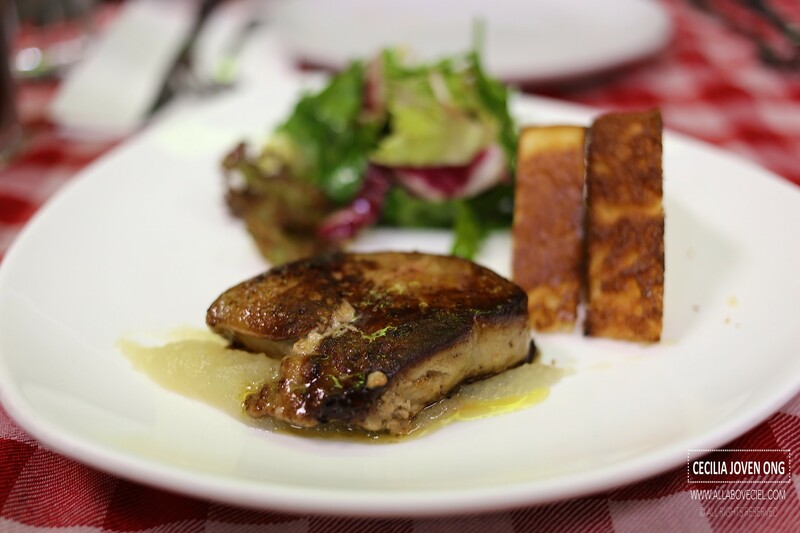 A thick slice of Foie Gras was nicely pan-fried to slightly charred it without compromising its juiciness and served with a handful of garden salad and buttered toasts. 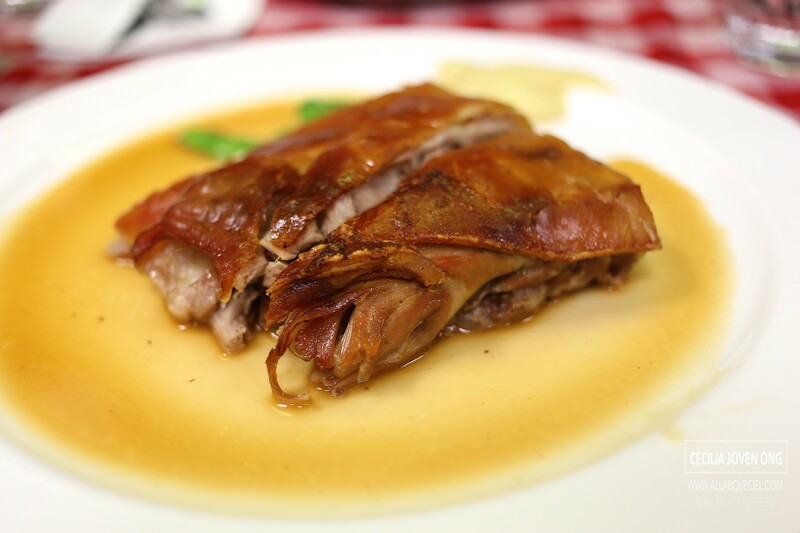 One of the main dish that we ordered was their signature Spanish style Roasted Suckling Pig at HKD $178, it was accompanied with mashed potato and honey beans. It was evenly roasted to give the skin a delightful crispiness, you could clearly hear the cracking sound when bite into the extremely crispy skin just lightly. 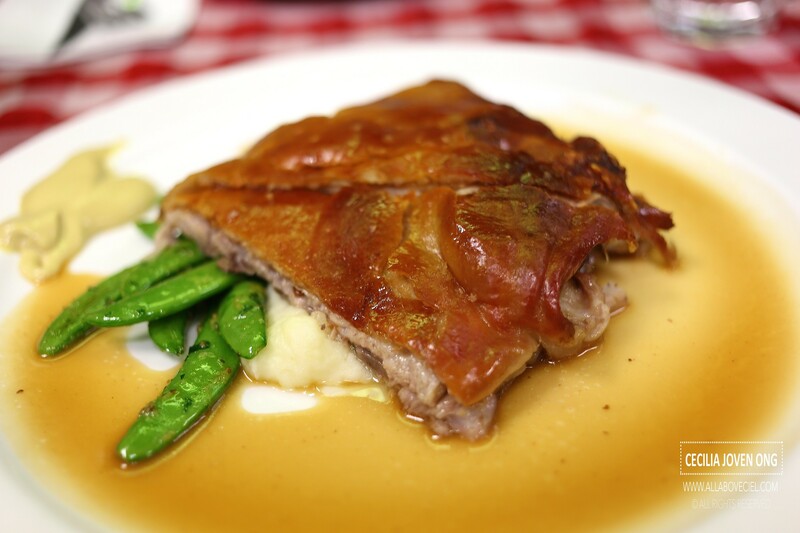 It was perfectly done to retain its tenderness within the meat and served along with mustard to go with the dish. 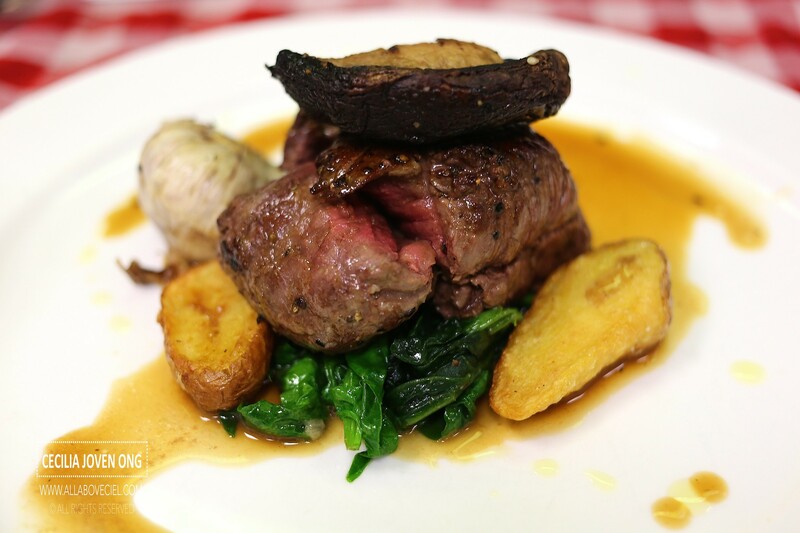 The Beef Tenderloin at HKD $208 came after a long wait. 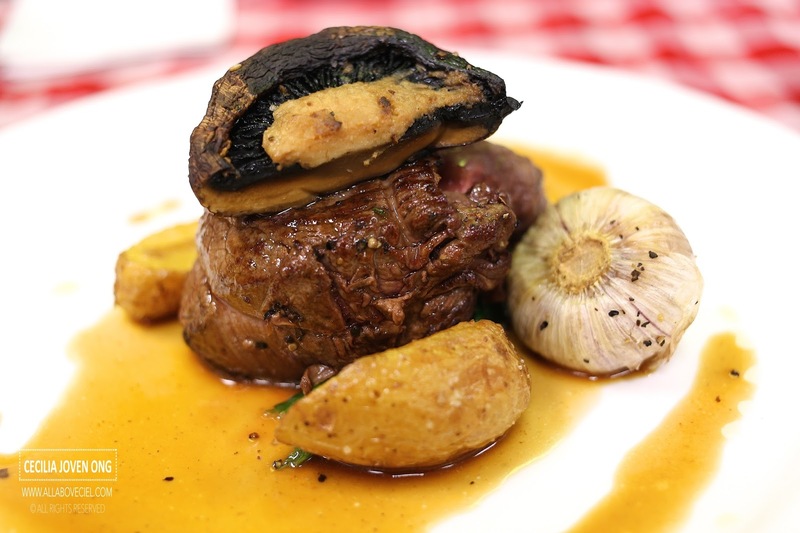 The dish consists of a chunky piece of perfectly grilled beef done to a right texture. 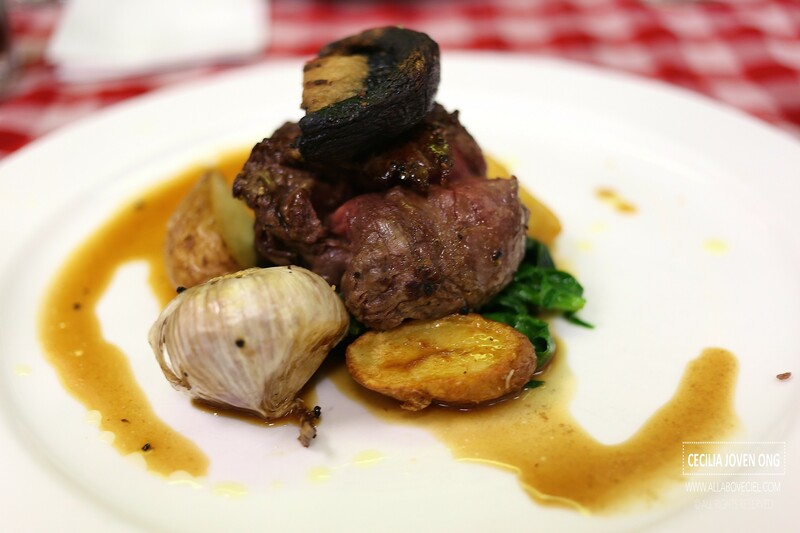 It was seated on a pile of sauteed spinach together with kipfler potato then topped with half a slice of mushroom. This was a lovely dish that i totally enjoyed. 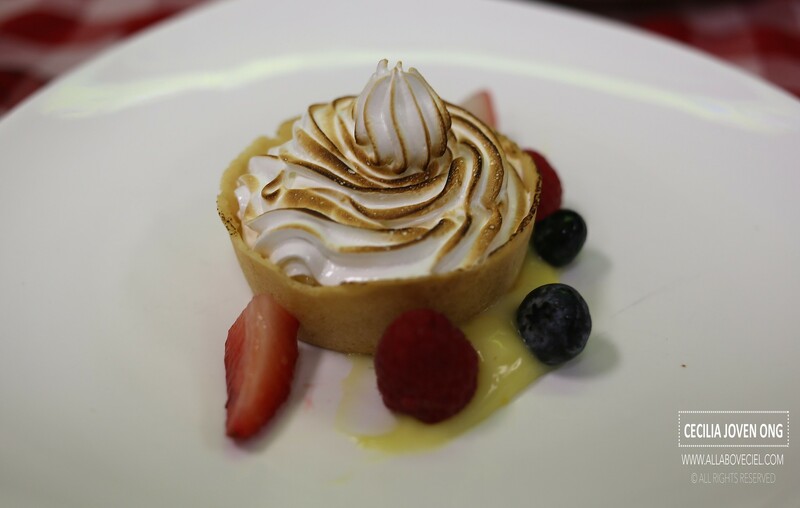 Lemon Meringue Tart at HKD $48 was one of the desserts that we ordered. It was served along with some lemon sauce with berries. This was a refreshing choice for dessert though it tasted a bit too sour to my liking but a good ending to complete a meal nonetheless. 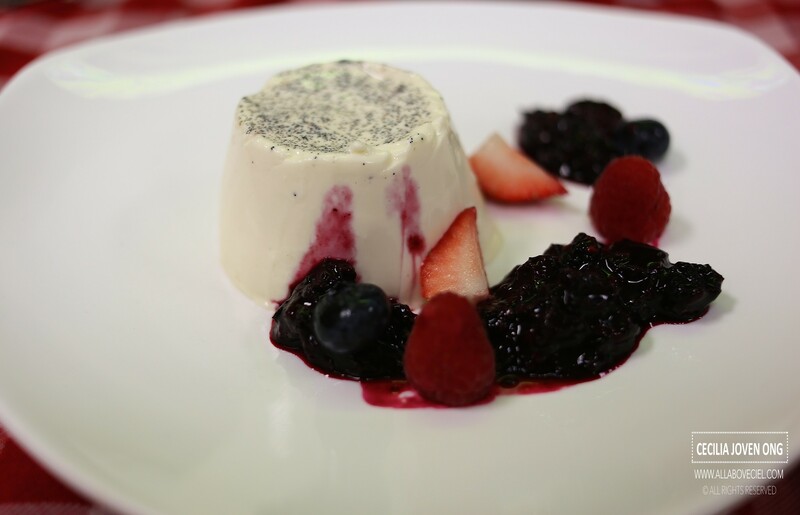 Next dessert was Vanilla Panne Cotta served with mixed berries compote at HKD $48. It was rather pleasant as well. This was a memorable birthday dinner, though the serving time in between the dishes was a bit too long but definitely worth the wait. 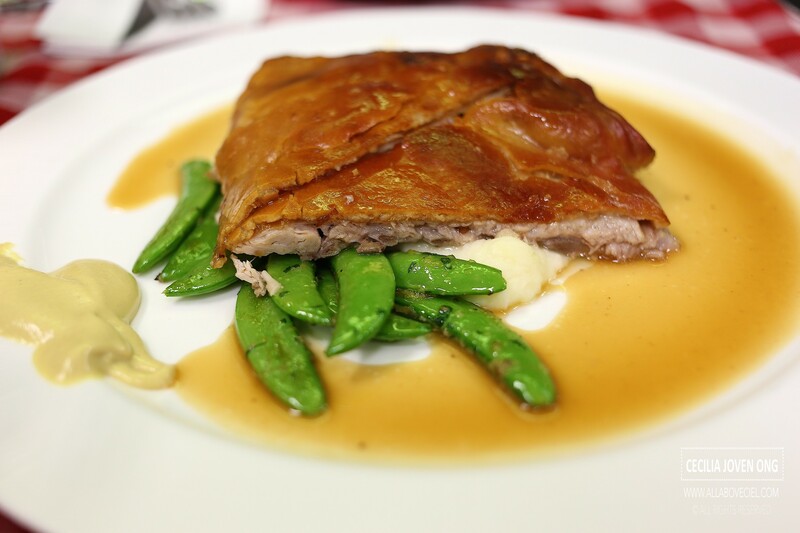 Food was good with an exceptionally impressive service that was quite unexpected in such an environment.